Find out news and updates on GCPawn and our locations. 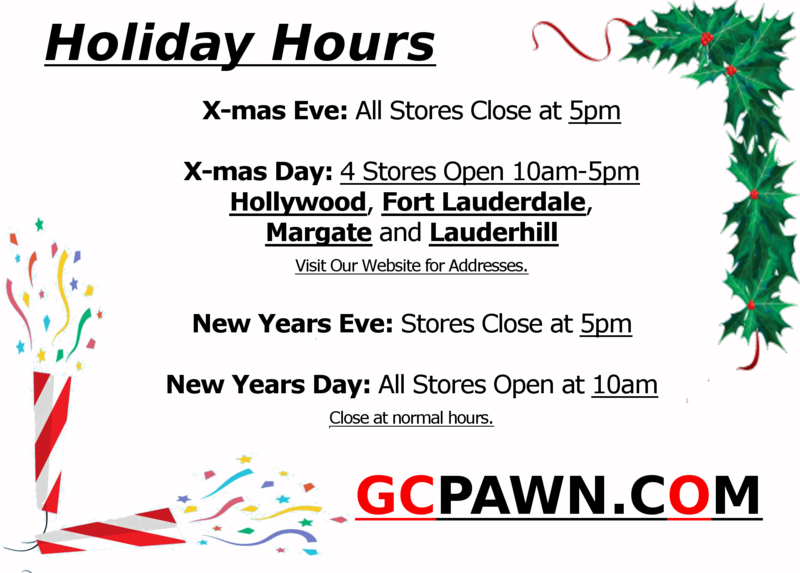 GCPAWN continues to bring excellent service to our customers by maintaining a nearly perfect record of being open for business, even on the holidays when most other businesses are closed. Christmas Eve: All Stores will close at 5PM. Christmas Day: Hollywood 1, Fort Lauderdale, Margate and Lauderhill will be open from 10am to 5pm. New Years Eve: All Stores will open at normal business hours and close at 5pm. New Years Day: All Stores will open at 10am and close normal business hours.